American Indian Community Development Corp. delivers housing on E. Franklin Av. A column by Neal St. Anthony about the new Anishinabe Bii Gii Wiin apartments in Minneapolis concludes by pointing to signs of hope for affordable housing preservation and cites GMHF's NOAH Impact Fund. 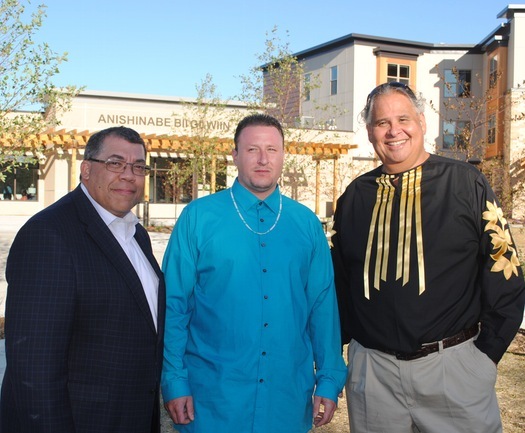 Paul Williams, CEO of Project for Pride In Living, from left, resident Gabriel Corbesia and CEO Michael Goze of the American Indian Community Development Corp. in front of the new Anishinabe Bii Gii Wiin apartments in Minneapolis. Gabriel Corbesia works as a security guard and recently graduated from Summit Academy near the top of his carpentry class. Corbesia, a member of the Lac Courte Oreilles Band of Lake Superior Chippewa who grew up in the Phillips neighborhood of Minneapolis, has wrestled with alcoholism and homelessness. Today, he is a thankful, productive citizen who also volunteers with the Alcoholics Anonymous classes at the American Indian Center on E. Franklin, and is looking for a new apartment after a fruitful stay at 20-year-old Anishinabe Wakiagun, which has 45 efficiency apartments and support services for American Indians who are struggling with homelessness, chemical and mental health issues. Corbesia, 35, looks forward to a carpentry job and productive future. He participated in the grand opening of the second stage of the affordable housing project. It’s called Anishinabe Bii Gii Wiin, an additional 32 efficiency apartments, dining and meeting rooms. The $11.4 million project, including a refresh of the original development, provides 77 small units in a beautifully landscaped setting that 25 years ago was a wasteland, littered with booze bottles at E. Franklin, east of Bloomington Avenue. Today, American Indian art galleries, coffee shops and small businesses largely have replaced gin joints and vagrancy. American Indian Community Development Corp.
Twin Cities Local Initiatives Support Corp.